Brett Luke | The Journal Gazette Komets players celebrate after beating Cincinnati in double overtime with over 70 shots in the game during the opening of the Kelly Cup playoffs Saturday night. Game 2 will be at 6 p.m. today at the Coliseum. 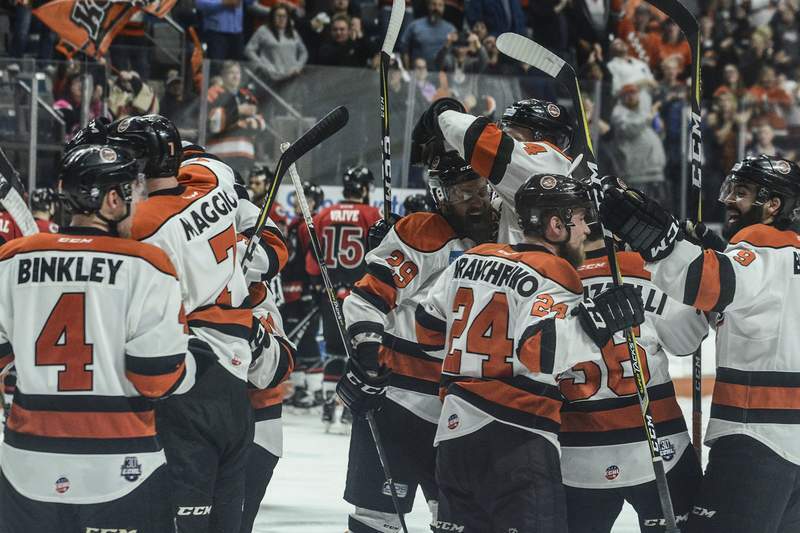 There was as much praise in the Komets’ locker room for rookie Kevin McKernan as there was for captain Jamie Schaafsma, whose double overtime goal cemented the Komets’ 4-3 victory in Game 1 over the Cincinnati Cyclones. As Schaafsma was shooting the puck, he could see one of the referees signaling no-goal on Desjardins’ shot. Schaafsma, who had missed 17 of the previous 21 games with a lower-body injury, wanted to make sure there would be no doubt. “I saw a lot of net. It was pretty easy to put that one in,” he said. The Komets are ecstatic – and they should be – on a night when they peppered the net with 72 shots, hit a few posts, endured a goal after the puck popped wildly off the boards and lost yet another star, Justin Hodgman, to injury on a Dominic Zombo hit. I said it before and I’ll keep saying it: This will not be a low-scoring series, not with the way special teams is a factor with these teams. Game 2 is at 6 p.m. today. Video highlights from the game are above.